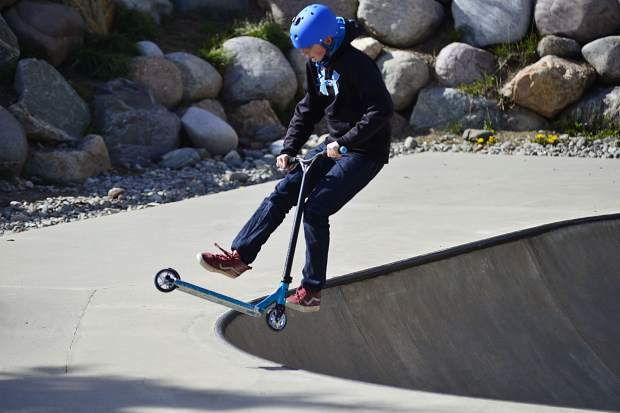 Jacob Rowe, 12, of Silverthorne whips his scooter in a 360-degree circle before landing back on it while coming out of a bowl Wednesday at the skate park in Silverthorne. Marcos Mathieu, 18, of Silverthorne jumps over a cone Wednesday at the stake park in Silverthorne. 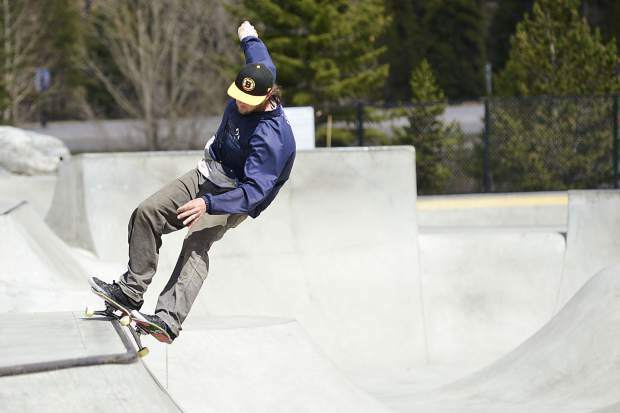 Dewey Cohen grinds the lip of a bowl Wednesday at the skate park in Breckenridge. 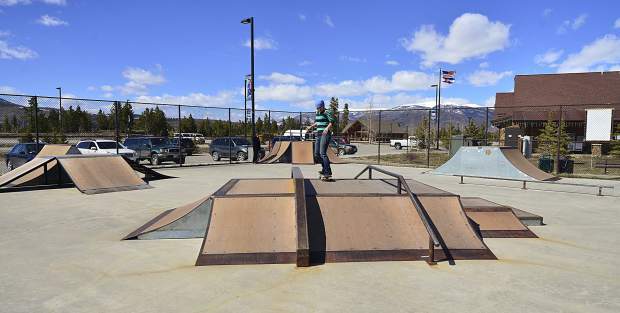 Skaters enjoy the city's skate park in Silverthorne on Wednesday. Taylor Carnell grinds a rail Wednesday at the skate park in Frisco while her husband, Ryan, a skateboard coach at the Woodward Copper indoor skate park, looks on. 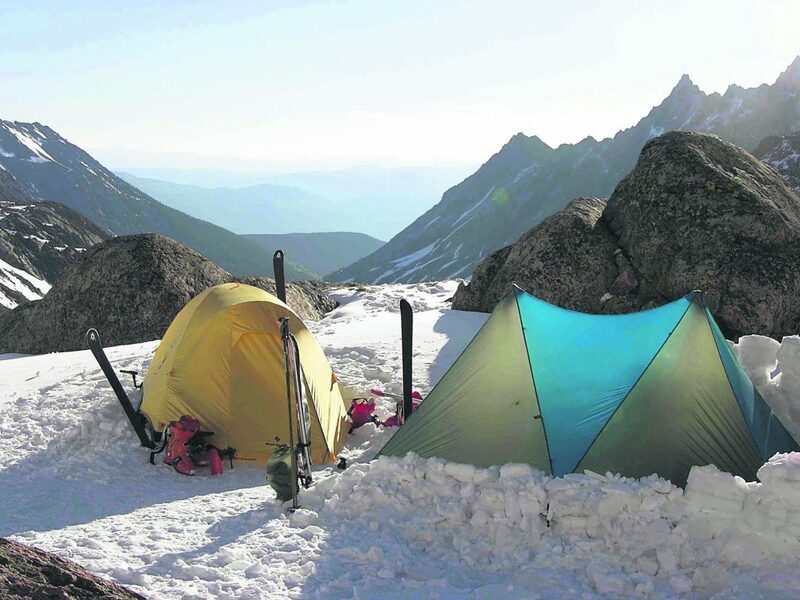 The couple said that of all the parks in Summit County, Frisco's is their favorite. Peter Holton, Vermont, 21, stalls on one of the half-pipe lips Wednesday at the skate park in Frisco. Skaters enjoy the city's skate park in Frisco on Wednesday. 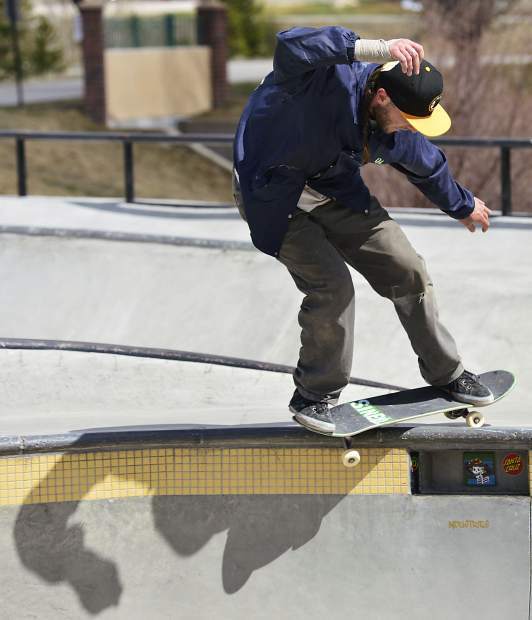 Aaron Golbeck, 23, of Breckenridge lands a jump Wednesday at the skate park in Breckenridge. Evan Walsh, 11, of Frisco easily clears a road cone Wednesday at the skatepark in Silverthorne. Ryan Carnell, a skateboard coach at the Woodward Copper indoor skate park, flies out of a half pipe, over a half-eaten lunch, Wednesday at the public skate park in Frisco. Aaron Golbeck, 23, of Breckenridge rides high up in one of the bowls Wednesday at the Breckenridge skate park. 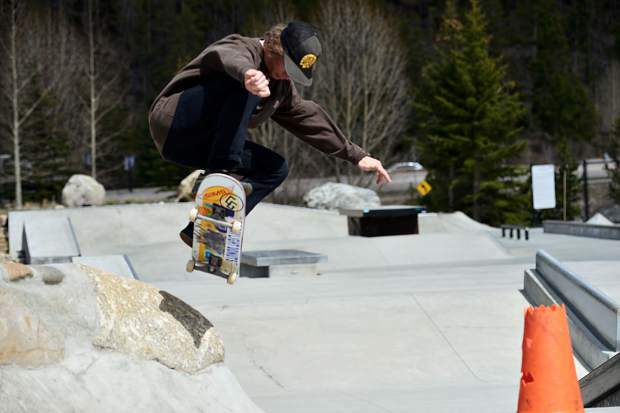 With more than $1 million invested across Summit County’s three municipal skate parks, the people who use them most widely agree the facilities here are top-notch. However, exactly which one stands out as the absolute best is not so unanimous. Generically ask the question — which parks they enjoy — and the answer is simple: everything. Get more specific, and favorites emerge. 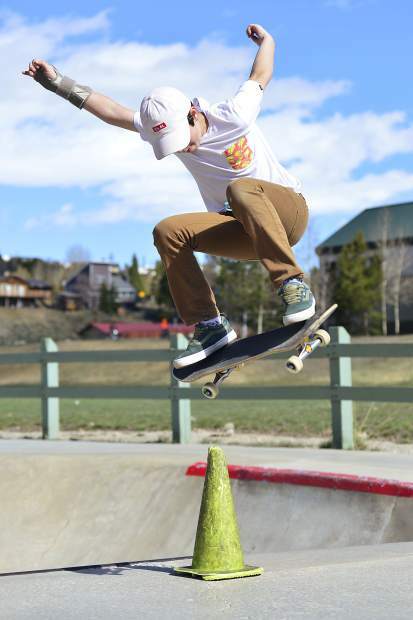 “They’re fantastic, they’re great,” said Ryan Carnell of the city skate parks in Silverthorne, Frisco and Breckenridge. He spent a portion of his Wednesday skating in Frisco with his wife, Taylor. The couple met at a skate park, and they each can handle their grinds and turns on the halfpipes. Catching the pair on skateboards is not an uncommon sight, and if they had to pick, each said Frisco is their favorite local place to do it. 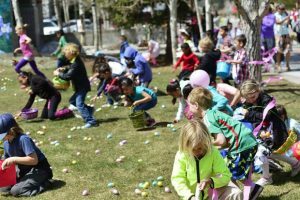 She said that while Frisco might have the reputation for being the “step-child” to the parks in Silverthorne and Breckenridge, it has more to offer than some might think. Ryan Carnell, who’s originally from West Virginia but works as a skateboard coach at Woodward Copper, said he loves the transitions and wooden ramps in Frisco, and it’s not lost on him how lucky the county is to have three city skate parks, a unique feature for a community with a population just over 30,000. Woodward Copper at Copper Mountain is another skate park in Summit County, bringing the total number to four, but it’s not a free endeavour, and the massive indoor park won’t be compared to Summit County’s parks created by taxpayer entities for the purpose of this piece. 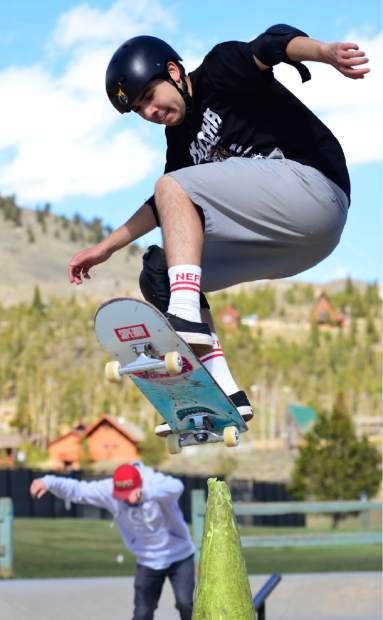 The most costly of Summit County’s city parks is the Breckenridge Skate Park, and it is hard to beat in Summit County, according to most skaters. The park underwent a massive face-lift completed in October 2014 to the tune of $650,000, according to the Summit Daily archives, and the project expanded the facility to almost a half-acre with an 11-foot bowl and features for skaters of all levels. For many of the skaters here, professional or amateur, there’s a lot to like in Breckenridge, and the park designed by Team Pain has no equal, at least locally. 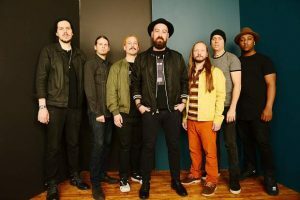 “Honestly, there’s a lot of different levels, in terms of beginner and intermediate, and there’s a lot of different things you can do here,” said Dewey Cohen, a 31-year-old veteran skater who usually spends about four hours three to four days a week at the park. Cohen is no beginner, he can hit the tricks and if he has to rank the parks here, it goes Breckenridge, Silverthrone and Frisco in that order. But not everyone is agreement here, and in addition to the Carnells, 21-year-old Peter Holton also prefers the Frisco setting over the other two concrete parks. An employee of a local ski shop, Carnell hit the skate park in Frisco twice on Wednesday, once during his lunch break and again after work. While he loves all three parks, Holton said there’s something about Frisco’s that just worth doing kick-flips over. “I think they are the best skate parks I’ve ever skated in,” he said of Summit County’s lineup before deciding on Frisco as his personal favorite. Frisco has spent more than $300,000 on its skate park since its inception, paying $203,405 for the initial build in 2001 and putting down another $44,407 and $53,673 to replace and fix the ramps in 2008 and 2010, respectively. 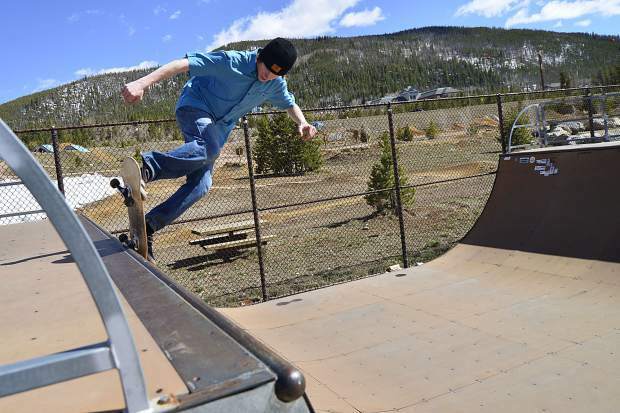 In comparison, the Silverthorne Skateboard Park was built in 1999 for about $240,000, with $75,000 of that coming from a grant, $85,000 from the town and the remainder coming through community donations and fundraising efforts. Like Breckenridge, it too was designed by Team Pain, and the Silverthorne park features a square bowl with a spine, metal coping, several bowled corners, escalators, hips, a pyramid with connecting pump-bump leg, ledges, handrails, banks and a tight quarter-pipe wall with pool coping. Since the initial construction, a few areas have been added on to in Silverthorne, and it now has a ninja wall, a one-foot drop-in box, rail, additional flat work and more. Noticing some deteriorating infrastructure, the town hired DHM last year to facilitate public input and develop a new design for the North West entrance of Rainbow Park. At this time, the primary topic being addressed regarding the skateboard park is improvements to the retaining wall on the northwest side of the park. Work is expected to begin in 2018. For 11-year-old Evan Walsh, of Frisco, the Silverthorne facility is his favorite but probably not for reasons one might guess. On one hand, he likes the park because of its proximity to his house, but on the other, it’s partly because he broke his wrist about two months ago in Frisco so it has a “bad reputation” with him. 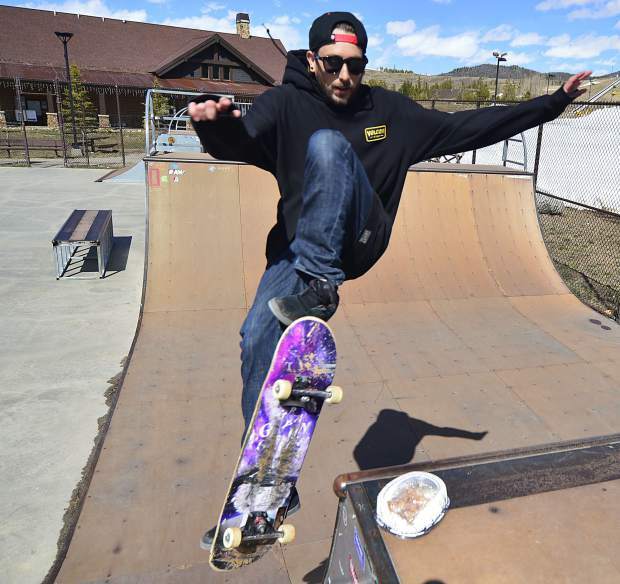 Like the other skate parks in Summit County, Silverthorne has made an investment in infrastructure that’s getting used, and it hasn’t gone unnoticed. More than three weeks ago, as I kept wondering how a county of 30,000 people can afford to build three parks, Frisco’s director of marketing and communications Vanessa Agee noted that she was seeing skaters already out at the Frisco skate park using it even though snow still blanketed much of the county. 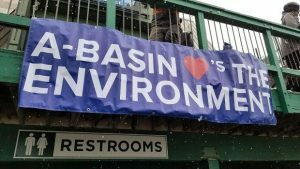 “It is pretty cool that they get out there and shovel it as soon as it gets a bit warmer — speaks to the skating community’s passion and spring fever,” Agee wrote in an email while explaining how much the city spent on the park over the years. The same thing happens in Breckenridge, though the skaters there said they are grateful for the added help of geo-thermal heating. Another testament to local skate parks’ value, in February 2017 the town of Frisco surveyed 60 members of the community on 21 possible community projects, and a skate park rebuild ranked No. 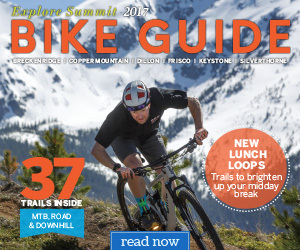 4, not far behind mountain biking trails, enhancements at the Nordic Center lodge and creating a natural play area, in that order.